nimm2 has been popular with children and adults alike since 1962, and is one of Germany's best-known brands of hard candy. The brand family is constantly expanding. Consistent with its main promise: "Vitamins and Sweets", the nimm2 range features happy sweet treats. Learn more about nimm2 on the official nimm2 Website. The fruit-flavoured hard candy with a tasty filling and vitamins is available in two varieties: Orange and Lemon. The two flavours also served as inspiration for the name: nimm2 ("Take two"). nimm2 Smilegummi are fruit gums made with fruit juice and vitamins. They are available in many different tasty varieties and flavours. nimm2 soft are fruit chews with all the best out of of nimm2: fruit juice and vitamins. Each pack contains four different flavours with several delicious fillings; nimm2 soft are also available in other varieties such as "Fizzy" and "sour". Perfectly shaped. nimm2 Lollies come in four delicious two-fruit varieties and are made with fruit juice and vitamins. The innovative Lollies are unusually smooth and round and enables an extraordinary lolly experience! nimm2 minis sugar free – "Vitamins and Sweets" – the portable version in a practical, resealable box. "Vitamins and Sweets" – nimm2 meets consumer expectations since 1962. The story of a successful concept. Today there are many more varieties today besides the classic fruit-flavoured candies and nimm2 Smilegummi – all with the best of nimm2. Whether nimm2 Soft, nimm2 Lollies or the nimm2 Smilegummis AppleBuddies and Shakies: the range includes something for everyone. Real Heroes at hand? Here they are: the nimm2 Smilegummi Heroes! Available in a colorful mix for much nibbling fun and creativity in just one bag! There’s something for everyone inside! nimm2 Smilegummi MilkBuddies are fun and cheer you up. 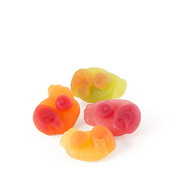 The first Smilegummi fruit gums shaped like figures are simply irresistible. nimm2 soft was launched in 2006. The chewy candy with a fruit-flavoured filling with vitamins comes in four tasty varieties and was an immediate success! The fruit gum success story started in 1996. With nimm2 Smilegummi, Storck launched a fruit gum with fruit juice and vitamins. An absolute milestone and a bestseller to this day! "If your child loves nothing better in the world than candy, and you love nothing better in the world than your child, give them nimm2." This TV commercial slogan played no small part in nimm2's amazing success. It all began in 1962 with nimm2 fruit candy, which had originally vitamins and a tasty fruit filling. Ever since, the slogan "Vitamins and Sweets" has stood for the successful, unique concept behind this well-established Storck brand - combining a sweet treat with the goodness of nimm2.